Tribal Football, headquartered in Australia, is one of the world’s leading football sites reaching over 90 million football fans every year. 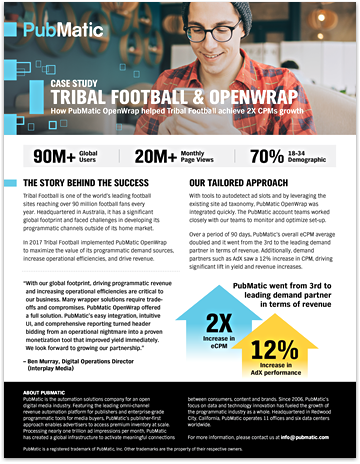 In 2017 Tribal Football implemented PubMatic OpenWrap to maximize the value of its programmatic demand sources, increase operational efficiencies, and drive revenue. Discover how the partnership has resulted in doubling the eCPM average and increased revenue for Tribal Football in our latest case study.